You can save buying kids bikes at Kmart stores. 15% is the amount of discount for kids' bikes like Marvel Huffy 12" Spiderman bike. Fan bikes for fun at Easter. Kmart also gives $10 cashback for $50 purchase of bikes. You have PJ Masks, Disney, Micargi, Schwinn, John Deere, Royalbaby bikes and they are on sale. Easter is a happy time of the year to celebrate with photo gifts and Target photo services are on sale. 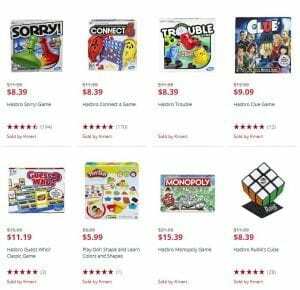 Target offers 50% off sitewide discount. Target coupons can be really nice additional savings while you are already aware of the weekly ad savings. Currently, Target Ad Preview is available. Browse the scan for in-car kid safety products, BOGO deals, personal care items, and more. You can use the coupon code "SITEWIDE50" until 20 April. All the digital technology for viewing your photos are cool but nothing beats and immortalized moment that decorates your tables or walls. I think printing photos will never be disliked. Get personalized photo cards and prints at Target. They can make puzzles with your photos. It can make a great gift. Buying something conventional is cool and it might be useful but photo gifts are more thoughtful and emotional especially when it's for the family. You have great shipping options which are economy, express, second business day, and next business day. You can shorten it as low as 3 days via UPS. If your graduation time is approaching, you might think of a good deal for that as well. Target graduation photo cards will be also at half prices. The deals are effective starting on Easter Sunday. 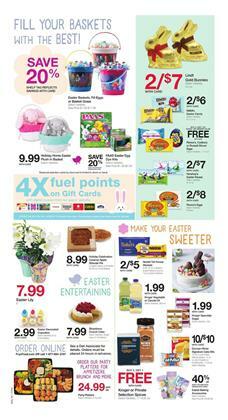 Target Easter Ad is also currently available. A major sale of the next week is car seats. In-car safety products have a really important role for the overall comfort of your ride. Leading brands like Graco, Britax and more are featured in this ad. Fantastic food prices, new Easter celebration products, a fine selection of meat and fresh products are in the Safeway Ad. Obviously, the discounts are not all the same. "BOGO Free" is a nice option to save practically on everything. Products like BBQ sauces, Oreo cookies, Dreyer's ice cream are BOGO deals of the week at Safeway. Club prices are also effective savings for customers. For example, you can buy USDA Choice beef ribeye roast for only $6.77 which is a club price. The important thing of today is the Easter savings. They made a product range for Easter saving. Just for U coupons that are available on pg 3, are great examples. Bob Evans side dishes will cost $2.49 with the just for u coupon. Discounts on food trays are also interesting. Pay only $10.99 ea for Grab N' Go appetizer trays. More everyday prices can be also your options. Monopoly Bonus Ticket items are browsable on pg 5. Visit Safeway stores to see $5/ea products like Signature Cafe 8-piece dark meat fried chicken. It will take place on 19th Apr. Fry's is one of the places to find a fine cut of meat. It's also a place for Easter products this week. 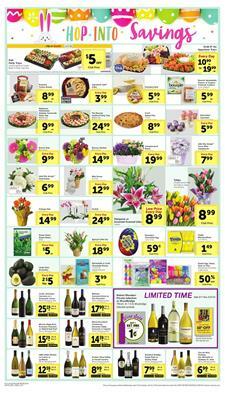 Fry's Weekly Ad Easter sale covers 3-day only sale. Digital coupons are redeemable up to 5 times for private selection ice cream and Kellogg's large size cereal. Buy 6, Save $3 mix and match participating items are an important product range of essentials. Buy Land O'Lakes butter for only $1.99! You'll be able to get Campbell's cream of mushroom or chicken soup for $.49! Fry's Easter candies or chocolate packs and Easter chocolate bunnies might be what you need for the stocking up for Easter. Lindt Gold Bunnies will cost only 2/$7! Buy Reese's, Cadbury or Russell Stover eggs with a Buy 2 Get 1 Free deal. PAAS Easter Egg dye kits will be 20% cheaper. Besides, earn 4x fuel points on gift cards. Also, save on grocery or snack shopping with the mix and match sale.